Good quilting, Sometimes it's all about the thread! Although I already knew good quilting is so reliant on the thread, I thought I would try some of what I had been reading about--experimenting with different threads in the needle and bobbin. Experimentation in this area was not fun. That doesn't mean I have given up; it just means that using different threads is now deemed well out of my comfort zone for now. Both were useful, but the needle up/down was a breath of fresh air. It was so nice not to have to grab and turn the wheel every time I stopped and started. Because this project had a white backing fabric, determined by what I had on hand, I wanted to quilt the center star in a gray 40wt. Floriani thread and everything else in white 40 wt. Isacord thread. I decided to thread the need with the gray and put white in the bobbin. Once I finally got the tension right, so that little if any of the gray showed through on the back, I began quilting. It was nightmarish. My machine did not like what I was doing. I re-threaded, changed needles, re-adjusted tension, and most of all, picked out lots of stitches. I limped through it the best I could with minimal gray loops on the back. The gray shows through, as seen in the photo at right. I'm thinking of painting it with white out or a little white acrylic paint just to camouflage it since this one square is the only one where the gray is so prominent. If anyone has any tips about using different threads in a domestic machine, please comment. I'd love to hear them. Not only am I enamored with quilting, but so are two of my four cats, Ryan and Kasey. For me, sewing is rarely a solo act. I call these two the twins, the first and fourth born of a stray cat that came to visit one day about eight years ago. Timi picked us to be her forever family. The rest is history. Ryan and Kasey's siblings, Kenni and Junior haven't caught the quilting bug. They prefer their quilts to be completed and on the bed before they wrap up in them. I quilt in front of a picture window that overlooks the backyard. These two simply love birdwatching out that window. Even when I am sewing, Ryan isn't afraid to walk behind my machine or on top of anything nearby, the higher the better; Kasey likes anything cushy where she can stretch out and make herself at home. The pile she seems to be holding onto at left, is a stack of ready-to-quilt blocks for two different projects. The quilt sandwiches are already layered, so this is probably as soft as a feather bed. 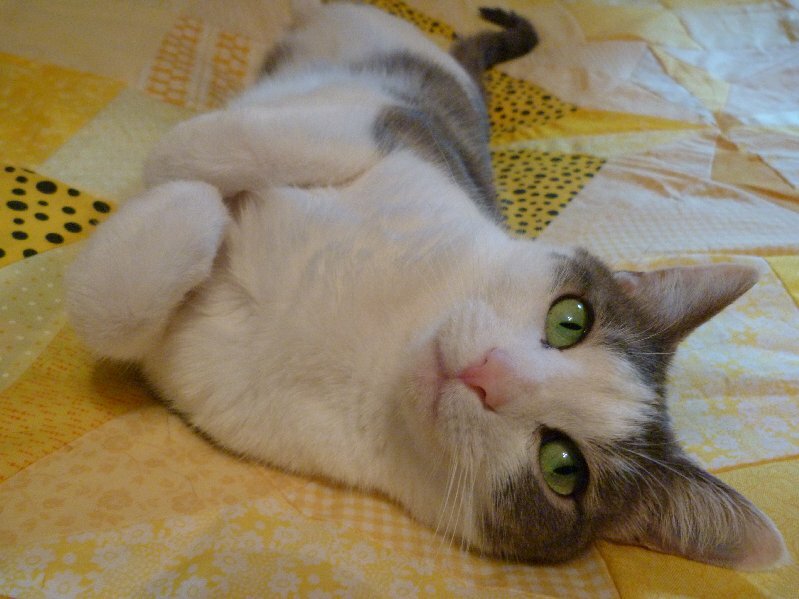 I've even had times where Ryan, the most gutsy cat I've ever known, will sit on top of a quilt while I'm stitching it. The machine noise doesn't even deter her. That isn't true of Kasey, a.k.a. scaredy cat. She is probably the most nervous cat I've ever known. That doesn't seem possible in her stress-free pose, but if she heard a noise, she would be out of there in a flash. The cats absolutely love my quilts, at all of their stages. In fact, most of the time, if I take a picture of a quilt, whether it is complete or in progress, Ryan is there. Here she is pictured on the quilt top of my now-completed yellow quilt. My new sewing machine--a Janome DC2014--has arrived and is working great. It came Monday, but not until 6:10 p.m., which really tested my anticipation skills. I failed. I am not very good at waiting. I tried to stay busy, but kept glancing out the window to see if the big brown truck was in view. It wasn't. Finally, while talking to a friend on the phone, I saw the driver with a big square box. Hurray! Once I unpacked the machine, I decided to wait to set it up. I did, however, check out all the attachments and read the instruction booklet. I figured that in the morning I could scavenge the thread, bobbins, and whatever else I needed from my old machine before inserting the new one in its place. The next morning I removed my old machine and replaced it with the new one. Although the two are very similar, the 30-year difference in their ages was evident. My old one looked like a clunky old Nash sitting next to a sporty new Mustang. I suspect this machine is simply an updated version of my old one, which makes the learning curve so simple. Threading it is identical, as is winding and replacing the bobbin. The only real difference besides age, is that this one has several more decorative stitches, which admittedly, I rarely used. It has a digital readout, which doesn't impress me in the slightest since I never had a problem turning a dial. The one feature it has that my other one didn't have, probably because it wasn't invented yet, is a programmable needle-up/down button. That one feature was my real motivation for wanting a new machine. When free-motion quilting, that feature is practically a necessity. I spent yesterday and today finishing a table runner, as seen above, while listening to Janome's steady hum. What a difference not to hear that whining, clicking, and clanging. I guess after 30 years, I really did need a new machine. As I awoke this morning, my mind raced with anticipation. It is hard to concentrate on mundane tasks. Today I am supposed to receive my new sewing machine; I ordered a Janome DC2014 from Amazon.com. It was so hard to settle on what to buy, but I knew it had to be a Jenome. I have had one for about 25 years that has been a work horse. It was the bottom of the line when I bought it from Sears, but I bought what I could afford. Unfortunately, cost had to be a high priority, then as now. I am pretty sure there is no new $6,000 Janome Horizon in my future, at least not unless I win the lottery. That would be difficult because I don't buy tickets. When I bought my sewing machine initially, it was to replace the old Kenmore my mother gave me. I wasn't a quilter in those days. Quilting wasn't even on my radar. I wanted to sew for my little girl. I did make an outfit or two, but mostly my sewing machine was utilitarian--patching jeans, fixing seams and replacing zippers, etc. For these things, my Janome Harmony 4200 was perfect. Then I began writing for a local newspaper. I covered several quilt shows, each time learning more and more about the historical, artistic, and many other aspects of quiltmaking. I met some of the quilters and simply fell in love with their work. It was there that my interest in quilting began. 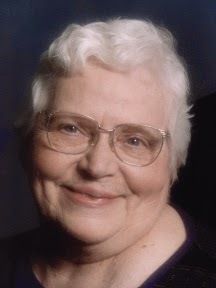 I was encouraged and inspired by the shows' organizer and former high school home economics teacher from Peotone, IL, Doris Kruger, a wonderfully spirited and insightful woman who was eager to help budding young quilters. My sewing machine finally had a new purpose--one for which it was intended. I made my first quilt, an appliqued rose pattern on alternating blocks. It was a very enjoyable first endeavor. I machine pieced the blocks, but the rest was done by hand. I decided I really loved hand-quilting. That was my favorite method until I learned about free-motion quilting many years later. I didn't think such a thing was possible. That was a couple of quilts ago. Now, I can't stop. I want to perfect this skill because I love drawing with thread. Free-motion quilting caused me to think about a new machine. The day after I decided to buy a new one, the tension spring on my machine broke. So now I need a new machine. And, today is the day! I have adopted a favored quilt block--the double star block. I have made so many of these that I am now calling it my signature block. There is something about this block, with its contrasting colors, all those various shapes within it, and all those not-so-perfect points, that just thrills me. I wonder if it were a different color if I would have become so taken with it early on. Purple, or more accurately violet, has always been one of my favorite colors. I made this block a couple of years ago as a part of a block-of-the-month (BOM) project in a Craftsy class, taught by Amy Gibson. I named this quilt, shown at right, Periwinkle Blue. My double star block is prominently located in the top left. This quilt was my first real free-motion quilting project--a quilt-as-you-go class also by Craftsy, and taught by Leah Day, who is arguably the best free-motion quilter and instructor ever. This quilt marked my first intoxicating step into the world of free-motion quilting, for which I cannot and do not want to escape. I was hooked. While the quilting on this project is rather flawed, it was so inspiring. 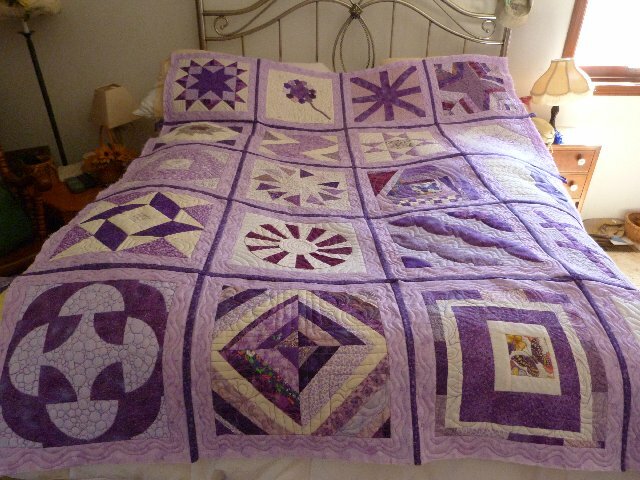 In fact, speaking of flaws, can you find the huge mistake in the quilting in the above block? Despite my glaring error, I still love this block. In fact, I love it so much that I have incorporated it into a table runner. I have made several of these for various friends and family members. In fact I have ongoing as we speak. Each one is different and I just love how they turn out. Here is just one example one of the many colors I've used. This was a birthday present when my mother turned 85. The funny thing is, I figure I've made five of these. That is three blocks each, plus two that I put into quilts. I have made 17 of these blocks. The latest one that I completed will go into the teal and yellow quilt I am working on now. Truth is--I screwed it up. This isn't a terrible mistake, but it is a mistake none the less. I didn't realize it until after I quilted it. I've quilted all of these the same way, so I should have noticed while I was doing it--but I didn't. I have no idea where my head was, but it was only after looking at it completed that I noticed the outer ring of star points is upside-down. It can hardly be called a double star when the star that would make it a double is not there. I suppose these are the kinds of things to laugh about, not to fret over. I don't suppose it matters anyway. The block is still beautiful. It is still one of my favorites. If you would like the instructions to make this block, you can find a link to it here.